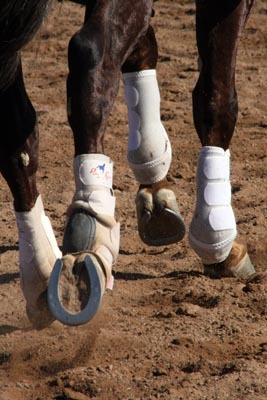 Do you wrap your horses' legs after a ride? I come from the racetrack, where wrapping legs was a given. But that was with horses that were stalled 22+ of 24 hours of the day. It worked better on some horses than others; some horses natually had tighter legs than others. On those that didn't, you could often see the difference in a tight leg and a filled leg if you didn't wrap them overnight. We left them on for 24 hours, but never more, even if we just took them off to re-rub and re-set the bandages. We used different things under the wraps - furasin sweat, or mud, or mud sweat, a rub-down with alcohol or just dry wraps - you got a feel for what was best for each horse. Sometimes we stood a horse in ice boots then wrapped the legs. 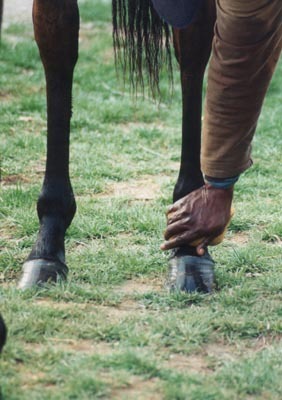 I did meet a physiotherapist recently who was against icing legs - she pointed out the circulation in horse legs is minimal enough, why would you want to make it harder by constricting blood vessels? The circulation is what carries the fluid out. I'm a big fan of cold-water hosing. 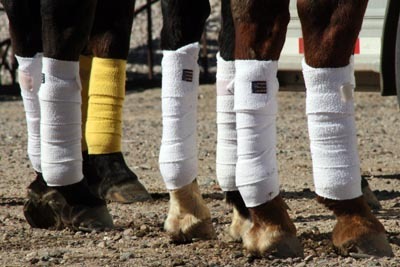 Translating bandaging to horses that are not stalled every day (i.e. endurance horses) - If my horse is going to be tied to a trailer after a 25 or 50+ mile ride, I would rather put standing wraps on all four legs to prevent him stocking up. If the horse is going to be turned out in a decent sized paddock after a ride, it depends on the horse, but I don't feel the wraps are as necessary because the horse is going to be moving around on his own, enough to keep the circulation going and the fluid from accumulating. Does it really matter if your horse has filled legs in the morning? (Because if he's being ridden the next day, it will likely work itself out.) I don't know. I just prefer to have cool tight legs in the mornings on an athlete, and for a standing/penned horse, I find it most often helps. Also if your horse cuts or skins a lower leg where it's obviously going to blow up, a furasin sweat works wonders for that. Does it take away from the natural inflammatory process, and is that bad? I don't know, but I use furasin sweats for those dings. Someone also taught me that if you put the plastic wrap outside the cotton wrap (which is against the leg) you get a better, longer-lasting moist sweat on the leg. I also agree that if you can't put a wrap on correctly you might be better off not doing them at all, because you might do more harm than good. All it takes is practice. I had lots of practice - about 10 years' worth - at the track. A couple of years I was wrapping about 20 legs a day. And I had carpal tunnel at the time - in both hands, but the right one was so bad I couldn't button my jeans or tie my shoes or use a pair of scissors or hold a Dr Pepper can (horrors!). Try holding a leg wrap - much less wrapping one on - in a hand that doesn't work at all, and one that barely does. it was a challenge! It's also best to use standing wraps (made of double-knit polyester) - not polos, not vet wrap - for standing wraps. The standing wraps have just the right amount of stretch in them for support, whereas the polos have too little, and the vet wrap has too much. What's your two cents' worth? Add your piece to Ridecamp on Endurance.net.